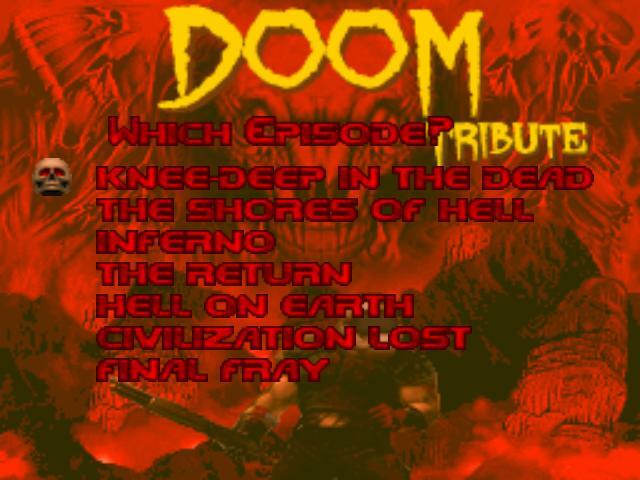 Late last summer, I was looking at the “ZDoom” forums when I happened to spot a really interesting-looking “Doom” WAD called “Doom Tribute Project” by the creator of the “Temple of The Lizard Men” series of “Doom” WADs. At the time of writing this “first impressions” article, the WAD is still in beta and it will possibly have changed by the time that this article out. Likewise, since this is a first impressions article, I only had the chance to play this WAD for a few hours before writing. 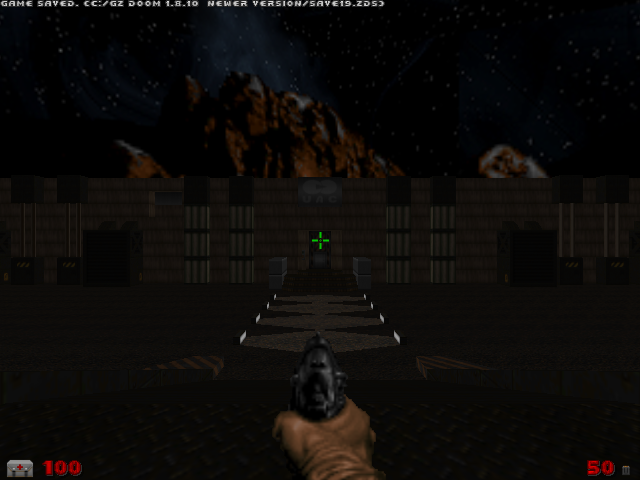 I also used the “GZDoom” source port whilst playing “Doom Tribute Project”. Nice! Why don’t FPS games have episodes any more? Although I’ve only played through the first, second and part of the third episode at the time of writing, I took a brief look at a couple of the other episodes. Interestingly, both “Civilisation Lost” and “Final Fray” appear to consist of new and original levels at first glance. However, the “Thy Flesh Consumed” episode from “Ultimate Doom” doesn’t seem to be present here, probably because it doesn’t fit into the storyline of the main “Doom” games. Yes, the game actually starts with a cutscene! 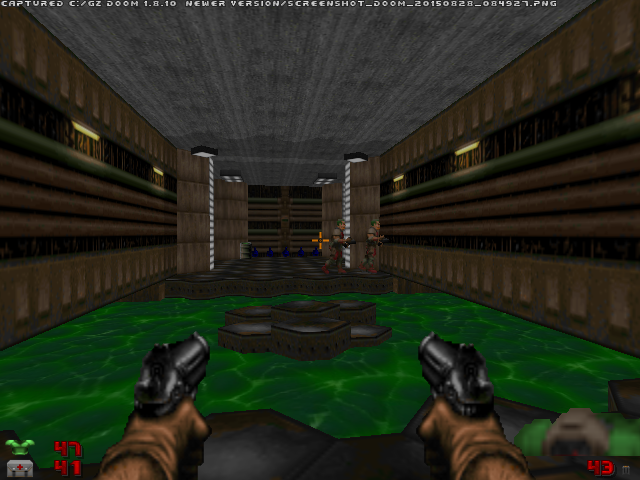 As I mentioned earlier, many of the levels in this WAD are based on classic “Doom” and “Doom II” levels – although they’ve been altered and updated quite significantly. The hell levels also look significantly more epic too. 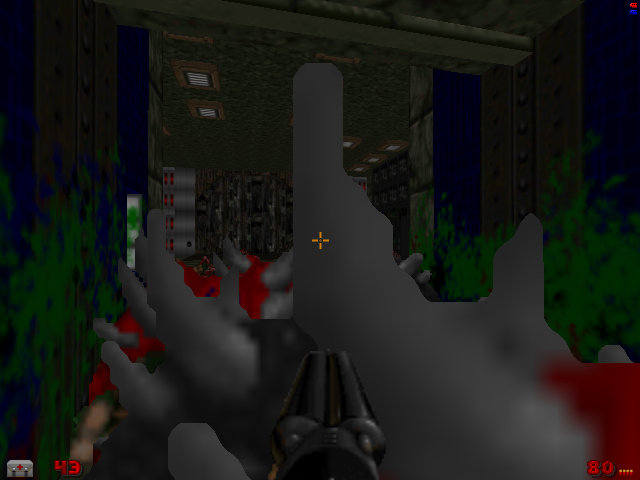 These changes work surprisingly well since, although there’s lots of places that you’ll recognise instantly, you can’t just rely on your memories of the original “Doom” games to get you through this WAD. The levels are familiar, yet excitingly new . They’re also a lot larger and significantly more challenging than many of the levels from the original “Doom” games were. Most of this challenge comes from both the increased number of monsters in this WAD and the fact that, in the early levels at least, ammo is in slightly short supply. 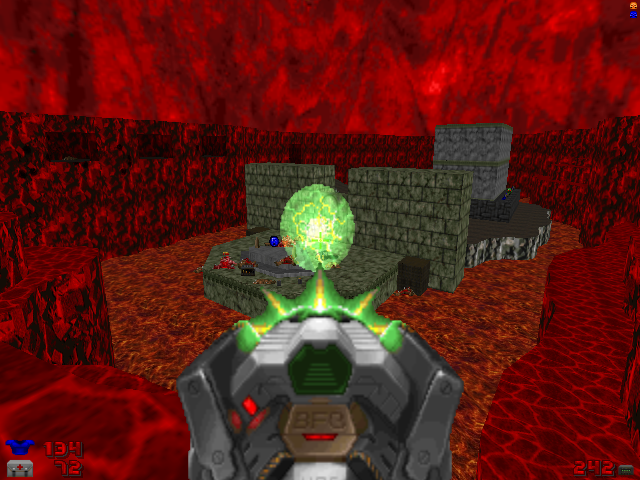 So, this is an enjoyably challenging WAD for slightly more experienced “Doom” players. Then again, if you’re still playing “Doom” in 2016 then you’re probably fairly experienced with it already. This level is from “The Shores Of Hell” but, as you can see, you occasionally end up “knee-deep in the dead”. One of the coolest changes in this WAD is the sheer variety of new monsters that you’ll face. Although many of the new monsters are ones that you’ve probably seen in other WADs, there are significant improvements to the zombies in this WAD. Seriously, there are probably at least ten or more types of zombie here. Although some of the new zombies carry more powerful weapons, they aren’t just the usual additional zombies that you’ll find in many other WADs. Why? Because they’re actually realistic. Yes, they still use sprite-based graphics, but the zombies are based on what zombies in a futuristic military research facility would probably actually look like. 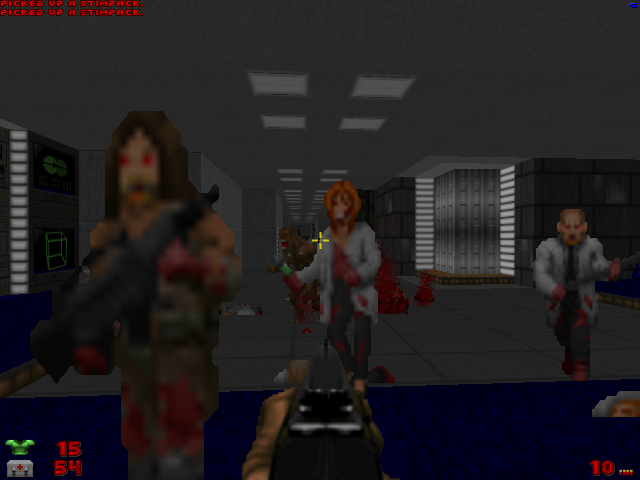 The military zombie in this screenshot also seems to be a reworked version of one of the player sprites from “Temple Of The Lizard Men III” too. In other words, there are several types of scientist zombie (eg: a bald man, a woman with brown hair, a man with blond hair, a woman with red hair, an older woman, a scientist in a biohazard suit etc..). There are also a plethora of different military zombies with different weapons, hair colours and uniforms. Plus, the military zombies also realistically include a variety of different male and female zombie soldiers – rather than the same few guys that appear in most WADs. So, yes, the first episode of this WAD seems a lot more realistic because it actually sort of looks like an off-planet facility that has suffered a zombie apocalypse. Seriously, why haven’t any other WADs done this? 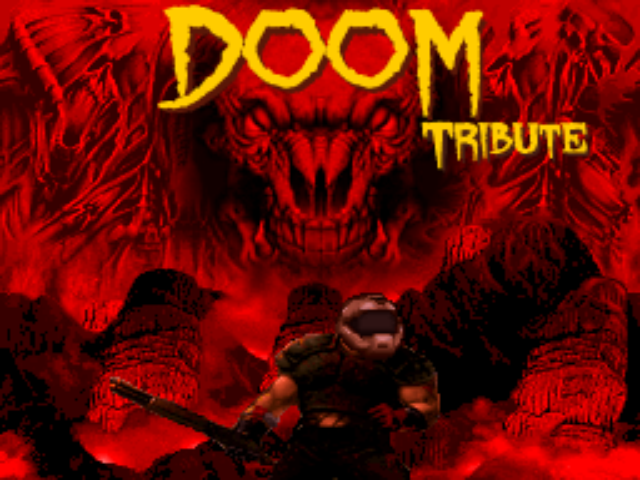 In addition to this, “Doom Tribute Project” is significantly more gruesome than the original games were. 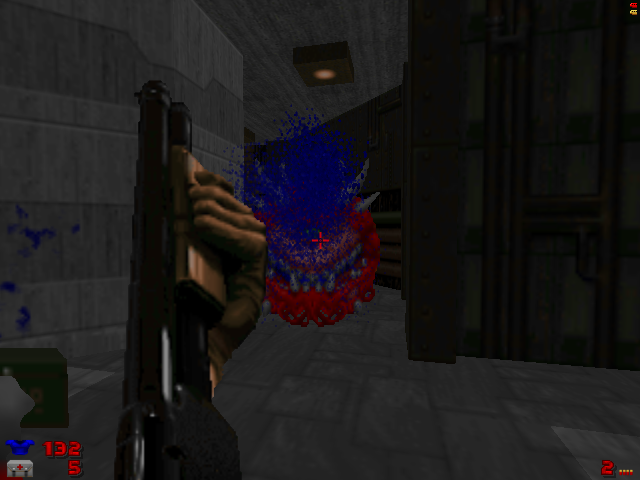 Although it doesn’t reach the cartoonish excesses of something like “Brutal Doom“, expect to see large blood sprays when you shoot a monster and expect to see “Quake II”-style gibs (accompanied by a squelching sound) when you blow up a monster. Plus, like in some other WADs, the cacodemons have blue blood at the Barons Of Hell/ Hell Knights have green blood. In addition to this, many of the monsters also have new death animations too – many of these are very similar to the ones that you’ll find in “Brutal Doom”, but they’re done in a slightly more understated and far less sadistic way. 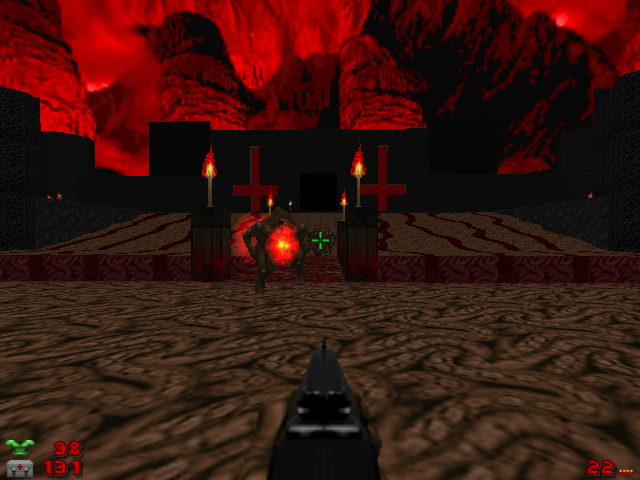 In other words, the creator of this WAD just uses quicker death animations, rather than any “Brutal Doom”-style animations that show the monsters dying slowly and/or in agony. It also looks a bit more badass too. According to the documentation that comes with this WAD, “Doom Tribute Project” also includes a railgun too, which sounds pretty cool. Many of the “standard” weapons have new sounds, some of these are better than the sound effects in the original game, but some aren’t quite as good (eg: the rocket launcher and the shotguns in the beta sound a bit underwhelming). 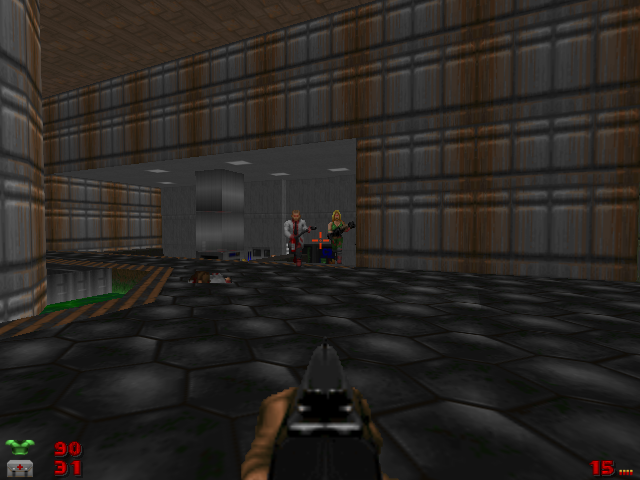 In addition to this, the basic pistol has some additional animation (eg: the hammer on the back of the gun actually moves whenever you fire it) and the BFG has a totally new sprite too. I’m not sure whether I prefer it to the original sprite, but it certainly looks a lot more futuristic. Musically, the beta of “Doom Tribute Project” is pretty cool and it features slightly heavier and/or more ambient covers of all of the classic MIDI music from the original “Doom” games. All in all, I really liked what I saw of the “1.1” beta of “Doom Tribute Project”. It’s an improved version of a classic game – with intriguingly altered levels and a gigantic variety of new and interesting monsters to fight. It’ll be interesting to see how this WAD changes over time too. If I had to give it a rating out of five, it would get four at least. 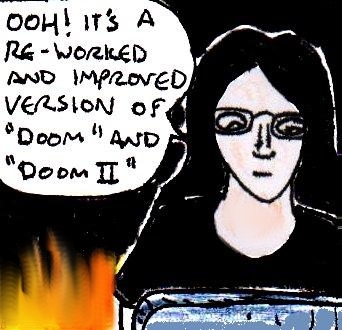 This entry was posted in Reviews and tagged beta, Doom II, Doom Tribute Project, Final Doom, GZDoom, mini review, review, WAD.